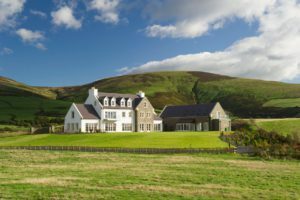 Occupying a secluded, scenic location on the Island’s west coast, approximately 4km (2.5 miles) from the picturesque village of Kirk Michael, this 6.5-acre property provides you with the opportunity to create a uniquely private home. 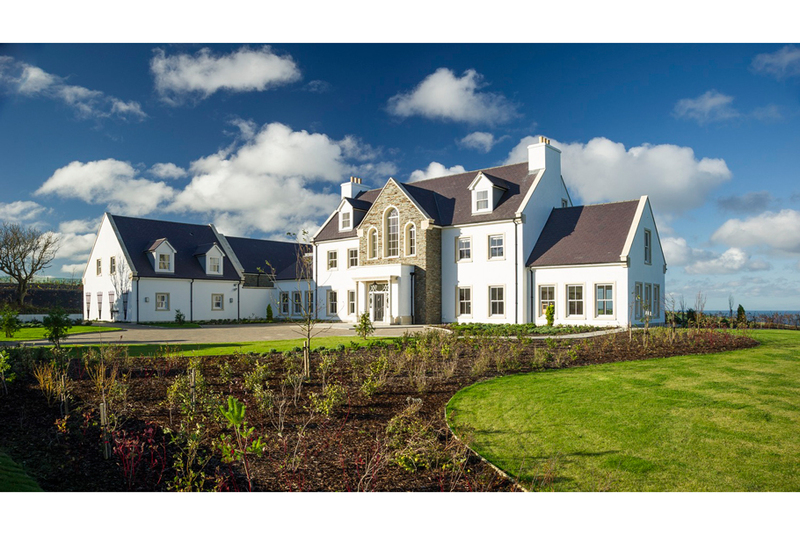 Less than 15 miles from the airport and only 12 miles from the Island’s bustling capital Douglas, Cooil Dharry successfuly combines privacy with accessibility; in every respect this is a home that offers the best of all worlds. Arranged over three stories, this six-bedroom property exudes style and sophistication. 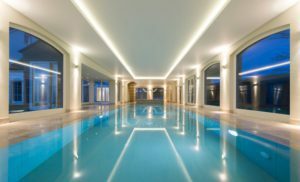 From the grand entrance hall with its triple-height ceiling and majestic sweeping staircase to the elegantly proportioned living accommodation and heated indoor swimming pool and spa, this spectacular country home is without comparison. 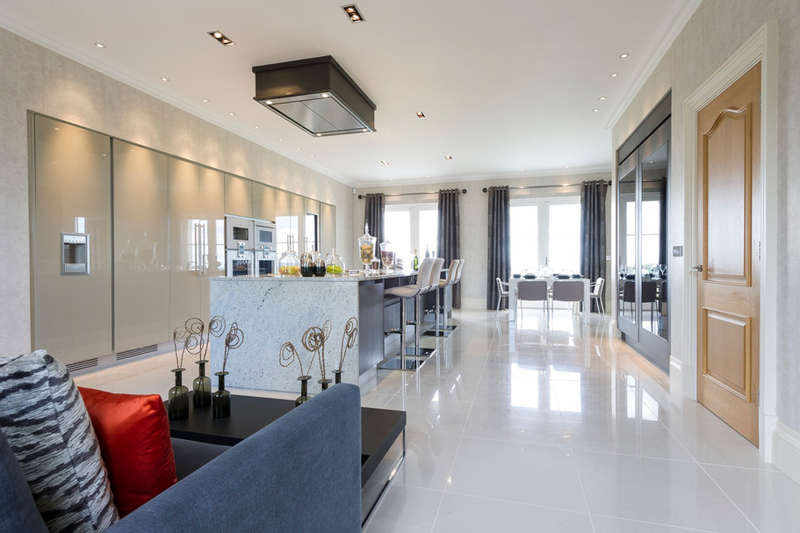 Innovative design and superb attention to detail combine to create a truly distinctive home. Whatever you have in mind, Cooil Dharry is the perfect home for work, rest and play. 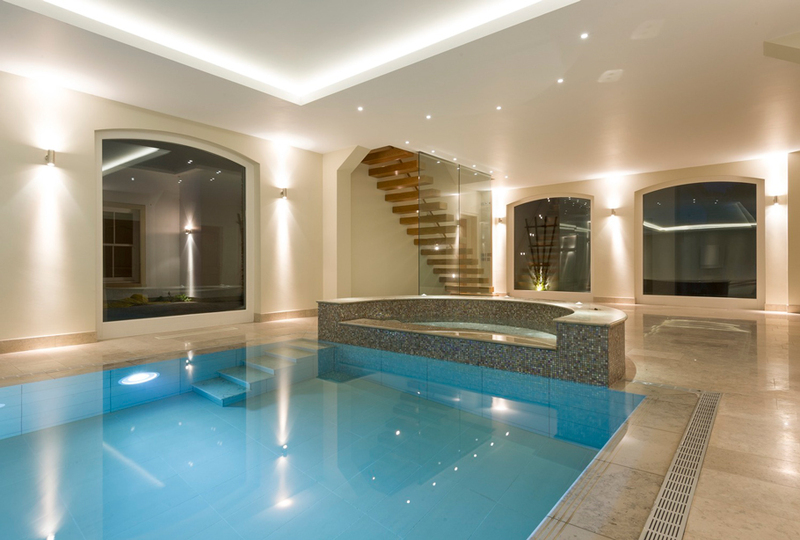 Start your day with an invigorating swim before heading off to the home office; invite friends over for brunch, enjoy a movie with the family, or host a fabulous dinner party – whatever your mood, Cooil Dharry can cater for every occasion. The bespoke handcrafted kitchen is both practical and stylish. Featuring Kashmir granite worktops, bespoke hand lacquered furniture and integrated appliances from Miele and Gaggenau, the kitchen provides you with every amenity; whether you’re cooking for the family, or catering for a large number of guests. There’s also a concealed cocktail bar and a generous wine chiller, so you never have to run out of your favourite vintage. Cooil Dharry has five spacious double bedrooms, plus an additional bedroom in the self-contained apartment. Stylish, sophisticated and featuring either walk-in or fitted wardrobes, each of the superbly appointed bedrooms features its own en-suite with Villeroy & Boch suites, Grohe fittings and luxury tiling. Created by our top design team, each of the bathrooms at Cooil Dharry have been created with relaxation, comfort and pleasure in mind; providing you with sumptuous rooms that you’ll want to linger in. 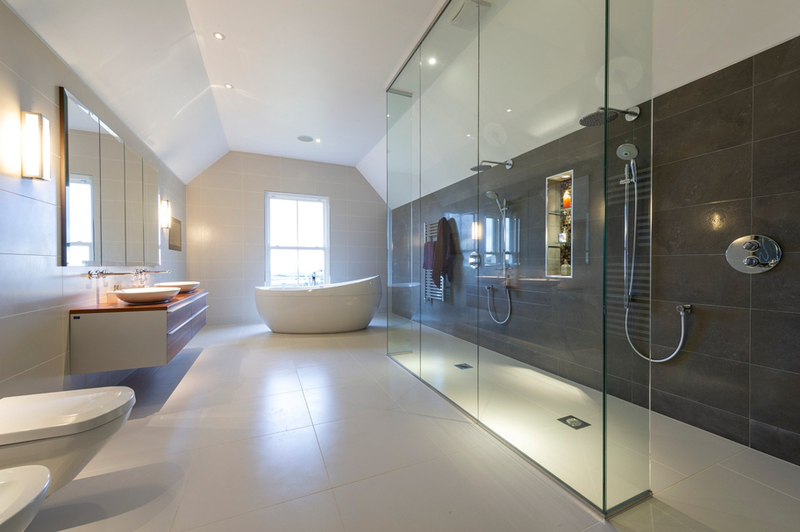 The impressive master bathroom features a stunning contemporary suite from Villeroy & Boch, porcelain flooring, Hans Grohe taps and shower and under floor heating to create a peaceful sanctuary where you can relax and unwind at the end of the day. Entering the property at the ground floor, the stunning triple-height entrance hall and superb solid oak staircase create a spectacular first impression. The light and spacious lounge can be found just off the main hall and features an open fireplace with marble surround with French Doors providing direct access to the terrace and gardens beyond. Accessible through the lounge is a beautiful day room, which features glazing to three sides offering uninterrupted views over the surrounding countryside and the sea. The large formal dining room can be accessed from both the hall and the bespoke hand made kitchen, which features Kashmir granite worktops, laquered furniture, Miele and Gaggenau appliances, wet bar and informal dining area. Just off the kitchen is the utility room and a family room which could also be used as a playroom or home office. 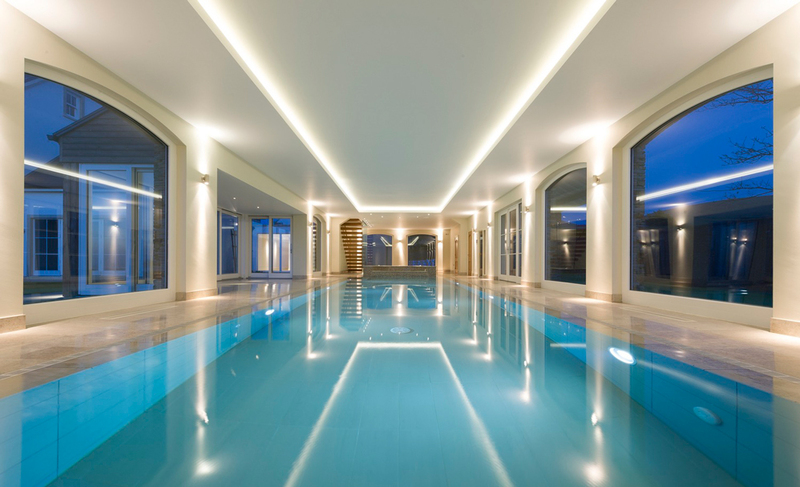 The south wing houses a triple garage and wine store in addition to the stunning indoor spa complex, which features heated swimming pool, changing areas and sauna. 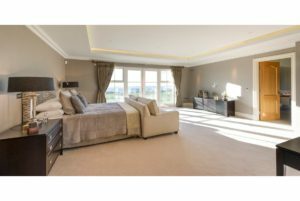 On the first floor the extensive master suite features large balcony with glazed balustrade providing fabulous views over the Irish Sea. 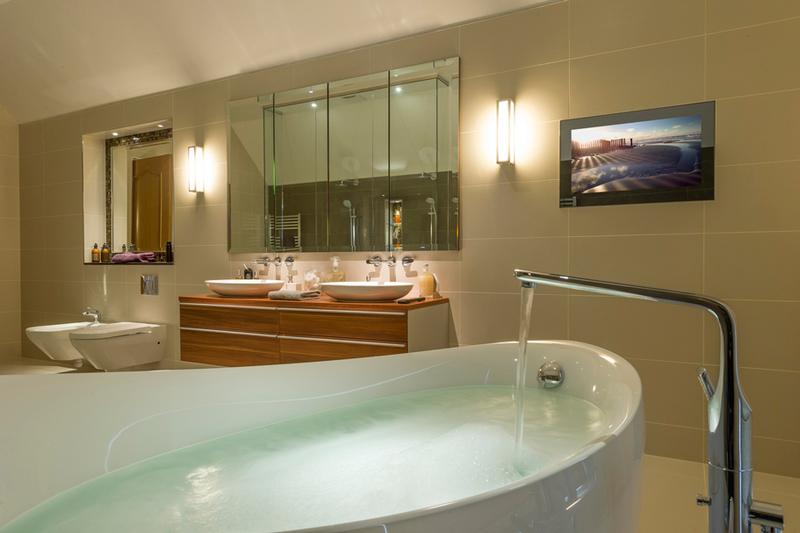 There are also ‘his and hers’ walk-in dressing rooms and a luxurious bathroom with contemporary Villeroy & Boch suite and walk-in double showers. There are two further double bedrooms, which both have fitted wardrobes and superbly appointed fuly-tiled en-suite bathrooms. The second floor also houses the home cinema and a large flexible room which could be fitted out as a gymnasium or alternatively, a games room. Above the triple garage a self-contained one bedroom apartment provides ideal accommodation for a live-in nanny or housekeeper. The third floor contains two extensive bedroom suites which would provide ideal accommodation for teenage children. Bedroom four has its own en-suite and there is also a further separate shower room; both have fitted wardrobes and provide plenty of room for study space or relaxing with friends. We have lavished great care and attention in ensuring that the design, quality and interior specification and finish of Cooil Dharry exceed your expectations. The following information provides you with details of the internal and external features of this unique home. Solid concrete floors and block partitions throughout to provide the highest levels of acoustic insulation. 7ft tall doors help emphasise the spaciousness of this home. Villeroy & Boch sanitary ware throughout with contemporary Villeroy & Boch vanity units to cloakroom and en-suites. Polished chrome Hans Grohe fittings. Independently controlled polished chrome towel rails to all bathrooms. Walk-in ‘wet room’ shower areas with thermostatically controlled Hans Grohe shower units. Italian porcelain floor and wall tiles and glass mosaic detailing. Bespoke hand made kitchen furniture with lacquered finish. 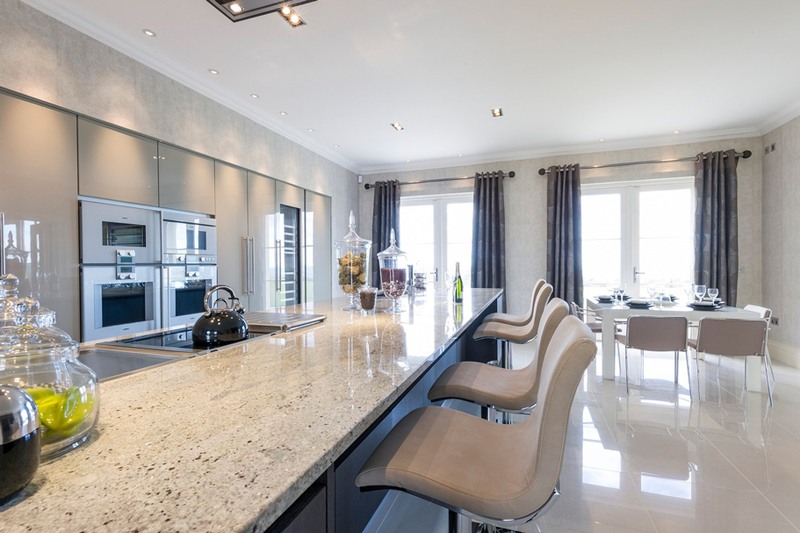 Kashmir granite worktops. Concealed cocktail bar. Fully integrated Miele or Gaggenau appliances include twin multifunction ovens, microwave, steam oven, coffee machine, island extractor, dishwasher, fridge, wine cooler, freezer, induction hob, teppanyaki and an electric grill. Blanco stainless steel sinks with stainless steel mixer taps. Italian porcelain floor tiles. Fully fitted his & hers dressing rooms to master bedroom suite. Fitted wardrobes elsewhere. Polished chrome low-voltage downlights to all reception rooms, cloakrooms and en-suites. 5-Amp lighting circuits to principle reception rooms. Polished chrome, contemporary light switches. Grade 2 security alarm system. Wiring has also been installed to facilitate the future installation of a CCTV system. Solid American light oak staircase. Oak veneered panelled doors throughout. Traditional block construction with reconstituted stone detailing. ‘Warm roof’ construction; 50mm insulation to external walls and floors. ‘Prestige’ range of hardwood windows and external doors, pre-finished with a low-maintenance micro-porous paint system. High performance double-glazed units with K-Glass and Argon gas. Stainless steel heavy-duty hinges, secure multi-point locking mechanisms and polished chrome handles. Ornamental wrought iron gates (electrically operated). Tegula block-paved driveway and courtyard. Low-maintenance, electrically operated garage doors with remote controls. High quality paving to pathways, patios and terraces overlooking professionally landscaped gardens. The information and images contained in this document are intended to convey the concept and vision for ‘Cooil Dharry’. They are for guidance only, may alter as work progresses and do not necessarily represent a true and accurate depiction of the finished product. This brochure does not form part of any contract nor does it form any representation or warranty in relation to the Developer, its Employees, Agents or ‘Cooil Dharry’ or any of their related developments. This brochure is designed to be illustrative of the development. Whilst these particulars are believed to be correct, their accuracy cannot be guaranteed and during the course of construction there may be some variation to them. Purchasers are given notice that: 1. These particulars do not constitute any part of an offer or contract. 2. All statements made in these particulars are made without responsibility on the part of the agent or the developer. 3. None of the statements contained in these particulars are to be relied upon as a statement or representation of fact. 4. Any intended purchaser or tenant must satisfy him/herself by inspection or otherwise as to the correctness of each of the statements contained in these particulars. 5. The developer does not make or give, nor any person in their employment has any authority to make or give any representation or warranty whatever in relation to Dandara Group or any part of it. 6. The selling agent does not make or give, nor any person in their employment has any authority to make or give any representation or warranty whatever in relation to Dandara Group or any part of it. 7. All photography and images are indicative only. 8. Bathroom and kitchen layouts are indicative only. Located in a superb position with unsurpassed views over the hills and the sea this property has been designed with luxury in mind. Incorporating the latest energy saving technology providing a superbly comfortable and prestigious home for an executive family. Set in approximately 7 acres of land this property provides privacy and space for the most discerning purchaser. 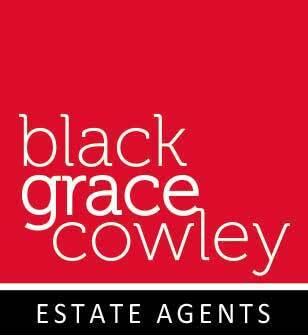 Providing just under 11,000 sq ft of accommodation and leisure facilities. Cooil Dharry provides the discerning buyer unrivalled levels of luxury and privacy.